Like many live casino providers Ezugi provides a range of Live Roulette game options. They use a mix of their own studio streamed tables and a selection of land based streams provided by other suppliers. 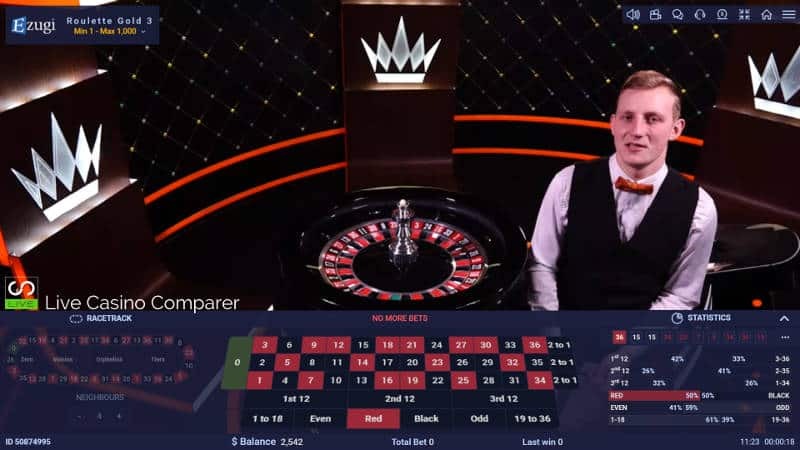 Live Roulette streamed from studios in Costa Rica and Romania. 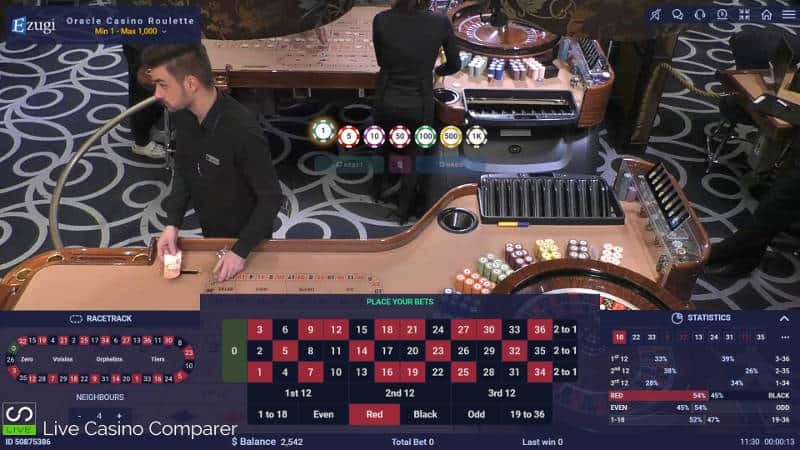 Land Based roulette that is streamed from real casinos in Malta and Romania. 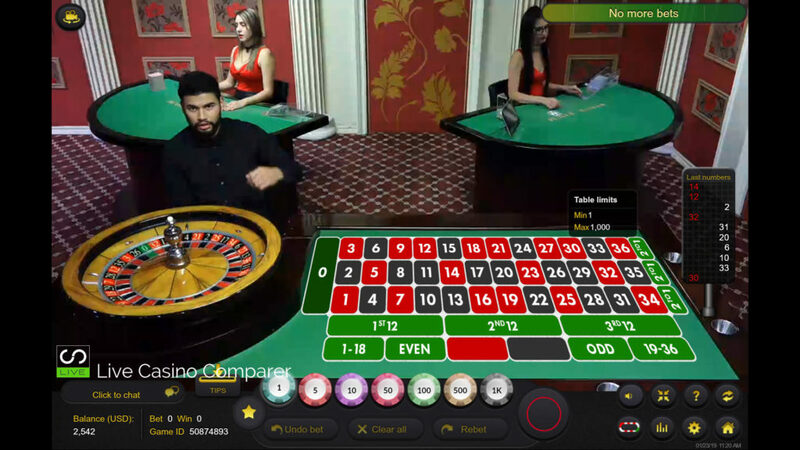 Auto Roulette that’s also streamed from Costa Rica. While the basic game is the same, you’ll find two versions of the Playing interface being used. There is the newer Interface used for all games streamed from Romania. Games streamed from the Costa Rican studio use the older & original interface. As far as I know all games will eventually use the same interface, but I don’t know when that’s likely to be. As I mentioned above, there are three live dealer roulette options. Lets explore them in a bit more detail. Studio Roulette from Costa Rica. Live Studio Roulette from Latvia. Live Streamed Roulette from Portomaso Casino in Malta. Live Streamed Roulette from Oracle Casino in Malta. Land based Roulette from Palace Casino in Bucharest. Save up to 3 Favourite Bets. Adjustable neighbours up to 9. Stats (up to last 100 spins). This is pretty much where it all started for Ezugi. The Costa Rican studio has two live roulette tables, both offering European Roulette. The playing interface is the older original one, but that doesn’t make it any less effective than the newer version. The betting grid is clear and it’s easy to place bets and see what’s happened in the past using the statistics. My only criticism is part of the wheel is obscured in both of the camera views. While not a major issue, most players including myself like to see the whole wheel during the game round spins. The dealers from this studio are particularly chatty so make sure you say hello! The Latvian Studio is relatively new to Ezugi and therefore benefits from more modern technology. The playing interface for the live dealer roulette has been improved. It’s full screen and optimised for mobile devices. Bizarrely you can’t save favourite bets, which is a feature of the older interface. Wheel positioning is better, but the wheel is still slightly obscured in normal view. 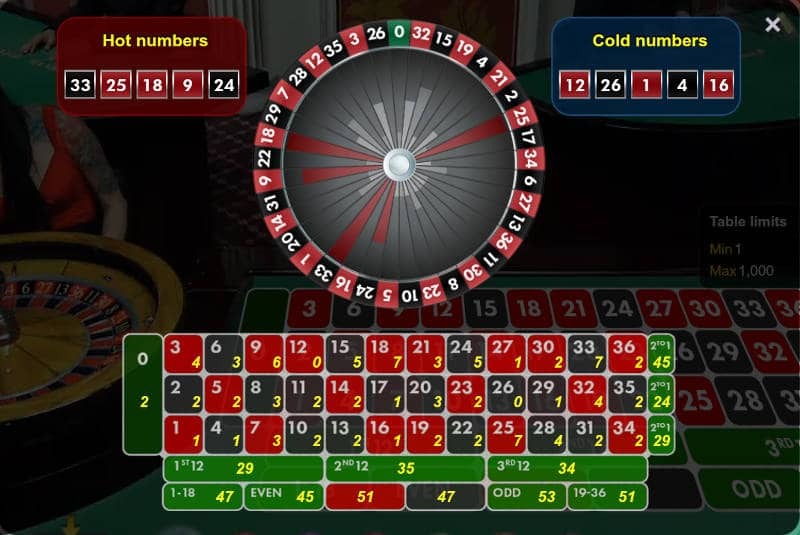 If you select Top View you get an overhead view of the wheel, however the bottom third is obscured completely by the betting grids. 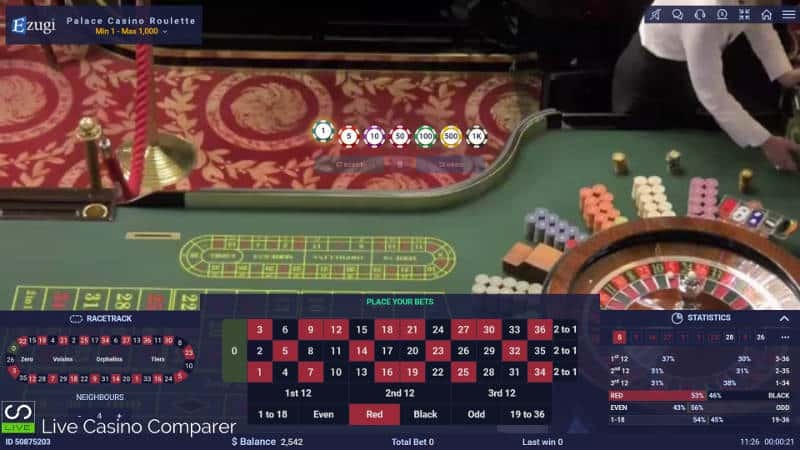 Ezugi OTT (Over The Table) Roulette is a land based table streamed online. In this case, it’s a service that Ezugi takes from Portomaso Gaming. 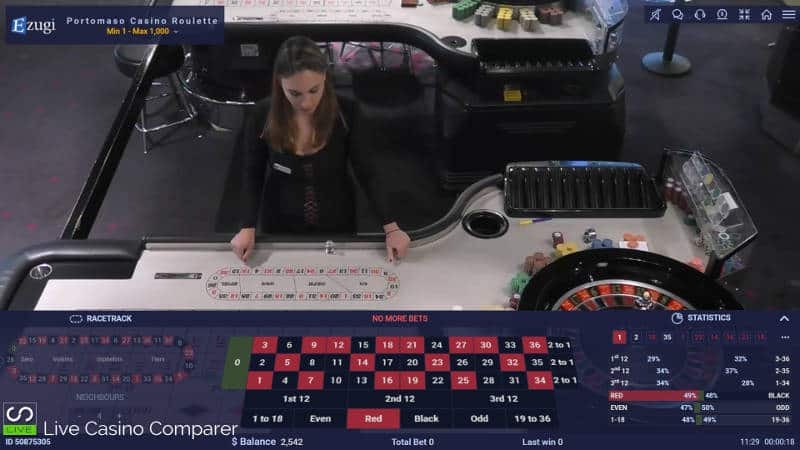 Two tables are streamed from the casino based in Malta. The cameras are embedded in the ceiling above the table, with the views switching automatically as the game round proceeds. Ezugi has overlaid their playing interface onto the stream, making it look and feel like an Ezugi product. This table from the Oracle Casino in Malta is essentially the same as the OTT Portomaso Roulette. The Oracle casino is more up market than the Portomaso, but that doesn’t really have a bearing on the live stream solution. Again, this uses the newer playing interface. Ezugi signed a deal in 2017 to build a studio at the Palace Casino in Bucharest, Romania. It’s from the here that one of their casino tables is streamed online. 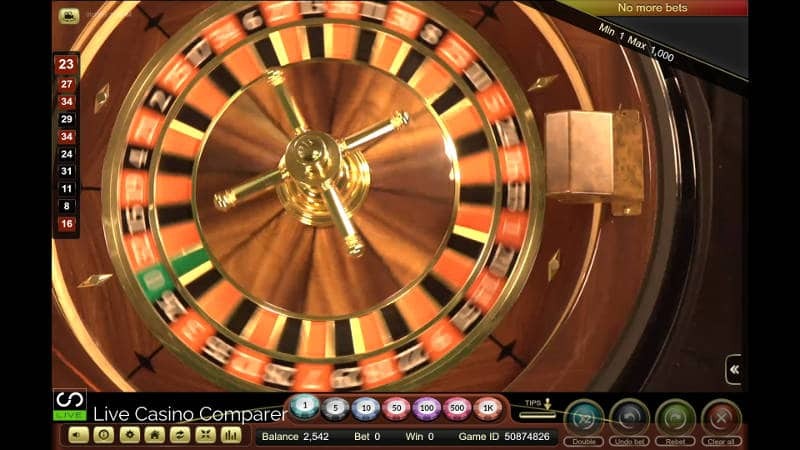 The live dealer roulette table uses the new playing interface with multiple camera view of the table and wheel. Live Auto Roulette is a popular alternative to the live dealer tables. Game rounds are quicker, so this version suits players that are keen to get on with it. The wheel is located in the European studio and runs 24×7, except when maintenance occurs for a few minutes. The older playing interface is used. Desktop users get the flash version while mobile users benefit from a newer HTML5 interface. Ezugi has a good live roulette product, they do the basics well and there is room for improvement. Differences with the playing interface between the tables creates a bit of a disjointed feel. I can see that a transition from the older to newer interface is in progress, however the new interface lacks the favourite bets functionality that players like. Adjustable neighbour bets and a wider screen mode are welcomed improvements. There is one area that I feel needs improvement and that’s with the view of the wheel during the spin process. Apart from the live streamed tables, you’re unable to see the whole wheel in view during the spin. Without exception the lower segment of the wheel is obscured from view on all tables. This is either by the leading edge of the wheel or by the betting interface. This is an important trust signal and something I feel Ezugi should consider adjusting in the future. You can play Ezugi Live Roulette at the following casinos. Note: UK players are unable to play Ezugi games as they don’t have a UK License.